As we got farther south in the river, one boat caught our attention. It wasn’t moving upriver and was broadside to the flow of boat traffic. Instead of hoisting our sails, we motored over to the Bayliner. As we approached, we saw an older man seated awkwardly on the bow, taking his electrical shore power cord off the stowed anchor and untangling the anchor rode. A teenage boy was with him. The man yelled back that their engine had died. We suggested they call Vessel Assist. He said that they had but that it would take four hours for help to arrive. By then, it would be dark. Right around then, we heard the Coast Guard on Channel 16 looking for someone to help this same Bayliner. Mark told the man and the boy that we’d try to tow them, and I radioed our intentions back to the Coast Guard. We circled around again while coming up with a plan. We decided to use the rode from our stern anchor as the towing line. Mark tied the bitter end in a bowline around our traveler (deemed stronger than our mast), and I tossed the other end to the boy, who tied it to the Bayliner’s bow cleats. I warned the Coast Guard and anyone listening on 16 that we had the Bayliner under tow in the river and requested anyone nearby to give us a wide berth. Before we got too far away from the boat, we yelled at them to stay on the radio so we could communicate our drop-off plan. When we started moving away from the Bayliner, stretching out the towline, we wondered: Would it hold? Would it snap? Would someone lose an eye? Would Sprout end up wearing a cone? We accelerated slowly, with Mark tending the line and the tiller. All was well. We passed the Coast Guard’s boats Blue Shark and Henry Blake, tied to their docks to our east, and a tugboat without a tow passed to our west, which was funny. It wasn’t the Coast Guard boats or the tug doing the towing; it was little old BRSRK with its 8-horsepower outboard! Since we were already in the river, we had little time to come up with a drop-off plan. We approached the south guest dock and saw some unsuspecting tourists enjoying the view, probably waiting for a table at Anthony’s. I instructed them to catch the Bayliner’s lines and help tie the boat to the dock. On the radio, we told the teen to cast off his end of the towline once the bystanders had the boat’s dock lines. The wind was from the west to our advantage, but the tide was flooding, which wasn’t to our advantage. Doing a U-turn in the river was out of the question; we would have to deal with the contrary current. A dogleg at the end of the guest dock helped in getting the Bayliner headed toward the bystanders. 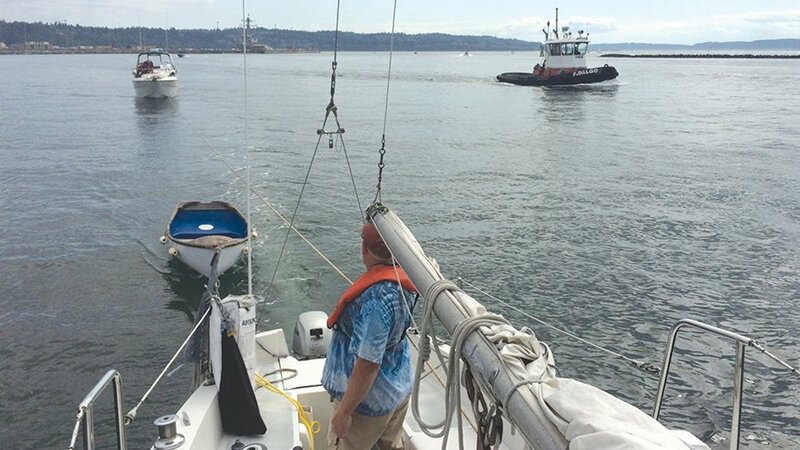 This went according to plan, except that the Bayliner landed starboard bow first, and the current swung the boat around on its bow before the stern lines were secured. At this point, Sprout attempted to abandon ship in favor of the dock; fortunately, I had leashed him to the mast. Meanwhile, we motored away from the dock, gathered in the towline, freed the dog, and turned BRSRK around. 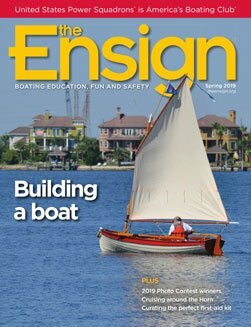 As we approached the now safely tied-up Bayliner on our way out to sea, the man shouted that his wife (and first mate) had passed away three months earlier; because he wasn’t able-bodied, he was trying to teach his grandson to be his new first mate. He was extremely grateful, which made me happy we had been able to help. The bystanders probably had a story to tell their friends about being in the right place at the right time. Plan ahead. Think about what line you’ll use and where and how you’ll attach it to your boat. Be prepared. Have a knife, boat hook, fenders, dog leash and whatever else you’ll need handy. Take care. Accelerate slowly when paying out the line. Stay in touch. Maintain communication with the other vessel. Be aware. Consider how the current, wind and depth will affect your boat, and make a plan for the tow and landing. Speak up. Don’t be afraid to ask for help from bystanders on shore. Develop seamanship skills. Towing is an exercise in good seamanship; take the USPS Seamanship course, and bring your friends! Evelyn (Evy) Dudey, JN, is a retired electrical engineer and a member of Everett Sail & Power Squadron/16. Besides sailing, she enjoys cross-country skiing, playing early music on her recorders and pumpkin sculpting. Evy has traveled to all 50 states and has had adventures on vessels ranging from bamboo rafts to freighters in 18 countries. Having grown up near the Great Lakes, Evy moved to Washington state after a job on a 56-foot summer camp ship introduced her to the fun and awe of messing about in boats. She has sailed aboard BRSRK in the Salish Sea with her husband and their dogs since 2002. This article first appeared in the squadron newsletter, The Pike Pole.